i presented a demo kitchen at the bainbridge artisan resource network back in september on browned butter - and in addition to pumpkin ravioli in a browned butter sauce, attendees were able to sample and take home some lovely brown butter snickerdoodles. i dropped a batch by j's office, and they were so well received i found myself wanting to make them again - but a straightforward repeat seemed a bit boring. 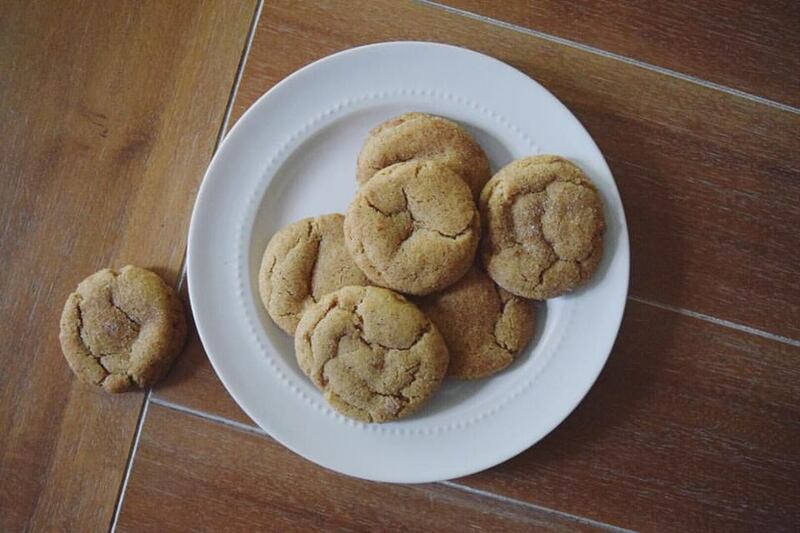 as a solution i decided to incorporate some seasonal pumpkin to make these pumpkin spice snickerdoodles. or pumpkin snickerdoodles. or pumpkindoodles. whisk together the flour, baking soda, cream of tartar, cinnamon, pumpkin pie spice, nutmeg and salt. in a medium sized bowl, stir the sugars into the browned butter. add the pumpkin puree, and stir in the egg, egg yolk, and vanilla, stirring after each addition. add the dry ingredients to the wet in 3 batches, stirring until just combined. chill the dough for 3 hours. this step is important, i attempted to skip it...my cookies were flat as kansas. so chill the dough. when ready to bake, preheat your oven to 350 degrees. scoop 1 tablespooon of dough out at a time and roll in the cinnamon sugar. bake on a parchment or silpat lined baking sheet for 9-11 minutes.